The Reach For A Dream Foundation kicked off its annual '#SlipperDay2019' drive with a media launch at KCC La Vie en Rose in Killarney on Thursday, 28 March. Over the last three decades, The Reach For A Dream Foundation has touched the lives of more than three million South African children, aiming to bring hope, joy and healing to them and their families by fulfilling their biggest dreams. "Fulfilling dreams gives parents hope and inspires children to believe in the power of what a dream can do," says Julia Sotirianakos, CEO, Reach For A Dream. 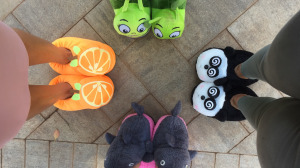 The Reach For A Dream Foundation encourages South Africans to wear their slippers to work, gym, the shops or even just around the house on Slipper Day (Friday, 10 May) in order to help support the annual initiative. Wristbands can be purchased for R10 at Pick n Pay, Wimpy or Dischem or any Reach For A Dream branch. For more information on how to get involved, visit www.reachforadream.org.za. Individuals can share a photo of their slippers on social media by tagging @ReachForADream and including the hashtags #slipperday2019, #courage and #inspiringhope. Newsclip has proudly sponsored the Reach For A Dream Foundation for over a decade by providing a media monitoring service, pro bono. For more information, visit www.newsclip.co.za. You can also follow Newsclip on Facebook or on Twitter.